Predictably, automakers are now combining the emissions-free powertrain technology with the popular and versatile body style. While mainstream models such as the Chevrolet Bolt and Kia Soul EV attempt to appeal to the masses by way of sub-$40,000 starting prices, these vehicles lack the style and luxury-lined cabins of pricier electric crossovers from marques such as Tesla and Jaguar. Introduced for model-year 2016, the Tesla Model X crossover builds upon the success of the company’s Model S sedan. Offered in 75D, 100D, and high-performance P100D trims, the three all-wheel-drive models are capable of traveling from 238 miles (75D) to 295 miles (100D) on a full charge. The Jaguar I-Pace is new for 2019 and marks the British brand’s first foray into the battery-electric-vehicle segment. Like the Model X 75D, the I-Pace comes standard with all-wheel-drive and is able to travel more than 230 miles on a full charge (234 miles to be exact). 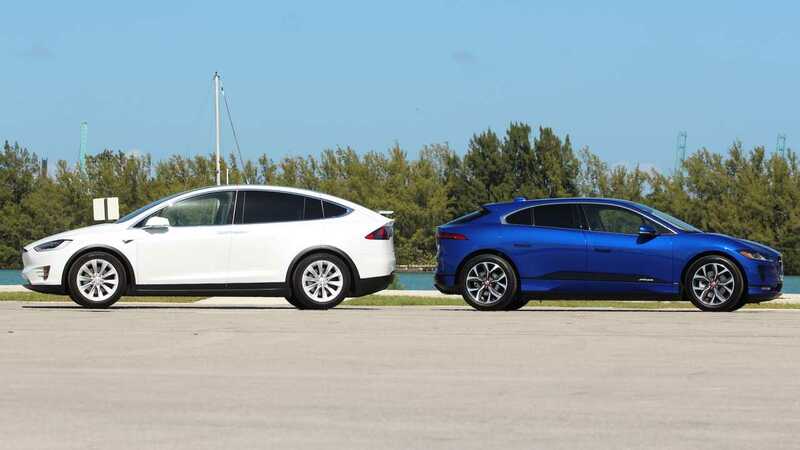 Although the two luxury crossover SUVs cast noticeably different shadows (the Jaguar seats just five and measures 184.3 inches long, while the Tesla offers seating for up to seven, when equipped with its optional third-row, and measures in at 198.3 inches stem-to-stern), both offer comparable performance and pricing. Well, at least the Model X 75D does. The more powerful 100D and P100D are both noticeably quicker, can travel significantly farther between charges, and are substantially pricer than both its entry-level sibling and the Jaguar, which is why we chose to compare the entry-level Model X 75D – and not a 100D or P100D – against the all-new I-Pace. Jaguar: Jaguar calls the I-Pace a crossover, but it can just as well fall into high-performance hatchback territory. While all-wheel-drive and an adjustable air suspension that affords up to 11.0 inches of available ground clearance and a wading depth of 19.7 inches are standard, the Jag’s low center of gravity (courtesy of its floor-mounted battery pack), and comparatively sunken seating position, provides it with an impressively car-like demeanor. This is the driver’s choice of the two. At least when the Dynamic drive mode is in play, a $700 feature bundled into the Adaptive Dynamics with Configurable Dynamics option (this tester also included the $150 Adaptive Surface Response system that adjusts power and brake settings based off of on- or off-road-surface conditions). The Comfort and Eco settings soften the springs and add a disheartening floatiness to the ride quality, but the sportiest setup tightens things up without sacrificing passenger comfort. Unsurprisingly, Dynamic mode also makes for far more predictable lateral dynamics from the 4,784-pound electric vehicle. (Additionally, Dynamic mode floods the cabin with kitschy, albeit rather hushed, faux engine noise.) With well-weighted steering, limited body motions, and a combined 394-horsepower courtesy of two electric motors (one at each axle), the I-Pace is an absolute riot to drive with enthusiasm. The trot to 60 miles per hour takes a manufacturer-estimated 4.5 seconds, and, thanks to the immediacy of the electric motors’ power, it feels even quicker. Whether flat-footing the I-Pace or lightly tapping at the accelerator pedal, the British EV reacts to inputs quickly and predictably. About the only ingredients missing from the Jag are steering feel and a brake pedal that progressively transitions between regenerative and friction braking functions. Fortunately, the crossover’s two-mode regenerative braking is strong enough to permit one-pedal driving during typical travels. The I-Pace is the driver's choice of the two. Tesla: With a curb weight of 5,307 pounds, the Model X crushes the scales with more than 500 pounds of additional mass relative to the I-Pace. That extra fat doesn’t go unnoticed either, and the Tesla feels more laterally lethargic than the Jaguar. Still, the Model X is more fun to pilot than its size would suggest. Credit the low-mounted battery pack, which helps quell body roll through turns, as well as the immediate thrust from the all-wheel-drive crossover’s two electric motors (one at each axle). In spite of its extra heft, the Model X 75D scoots to 60 miles per hour in a manufacturer-estimated 4.9 seconds, or 0.4 second behind the I-Pace. Not too bad for such a heavy thing. Two drive modes are available: Chill and Sport. As its name suggests, Chill is the more tranquil setting and the accelerator responds less effusively to inputs in this mode. Sport improves accelerative responses. Regardless, the big Tesla never feels short on power, and the crossover is always apt to pass slower moving traffic or merge onto freeways. The Model X is the more comfortable choice when driven casually, too. Its ride is taut yet cushy, and its brake pedal does a far better job of switching from regenerative to friction braking, although one-pedal driving is possible with the regen placed in the strongest of its two settings. While the Tesla’s ride quality and brakes just edge out those of the Jag, its less engaging persona and slightly slower acceleration ultimately swing the needle in the direction of the I-Pace. Jaguar: The Jaguar is the obvious style champ in this comparison. Low and sleek, the I-Pace pulls design cues from the British marque’s past while simultaneously looking toward the future. Due to the lack of an internal combustion engine, the I-Pace sports cab-forward styling that maximizes cabin space. Despite its stubby hood and tall tail end, the Jag is truly a handsome thing, and its body clings tightly to the 117.7-inch wheelbase like spandex on a yogi. This top-of-the-line HSE model features even more visual pizzazz courtesy of its 20-inch wheels and tires, $100 worth of front fog lights, and $575 in Caesium Blue paint. The interior is equally as stylish, and high-quality materials combine with a pair of console-mounted screens that give the I-Pace’s futuristic insides a touch of old-world charm. That philosophy extends to this I-Pace’s interior options, which include $100 for cabin air ionization, a $200 Activity Key (a wearable proximity key), a $200 aluminum trim finisher on the dash, $250 for 10 different ambient interior lighting options, $800 for four-zone climate control, $900 worth of gray suede headliner, and $2,400 for a pair of 14-way adjustable seats that both heat and cool. The thin seats look as good as they feel, and their adequate cushioning and generous bolstering make long and dynamic drives an utter joy. Opting for the Jag’s pricey Performance seats also adds seat heaters to the rear outboard seating positions. Although the three-across rear bench is cushy and comfortable, the space it affords is on the smaller side, especially for the middle-seat passenger. With only 35.0 inches of legroom and 38.1 inches of headroom, the I-Pace’s rear compartment is down 3.4 and 2.8 inches, respectively, to the Model X. Despite its stubby hood and tall tail end, the Jag is truly a handsome thing. Tesla: Next to the low-slung I-Pace, the jelly-bean shaped Model X might as well be a school bus. It’s a far more utilitarian looking thing that emphasizes space over style. That’s not to say the Tesla is without its share of parlor tricks. The crossover’s grille-less face adds a distinct look to the Model X, while its “falcon” rear doors continue to tickle us with delight. The Tesla’s interior is a testament to minimalism, and its simple and modern design is a refreshing reprieve from the Jaguar’s comparatively busy cabin. A massive touchscreen controls much of the crossover’s infotainment and convenience features, and allows the dashboard to be largely free of physical buttons. Material quality throughout is generally impressive, too, although the limited mix of textiles makes for a comparatively dull appearance. Both the first and second rows offer plenty of room for stretching out, while a large piece of front glass that stretches past the dashboard, as well as glass in the roof panels of the rear doors, brings an additional sense of airiness to the interior. This Model X also includes a $3,000 third-row seat, bringing its passenger capacity up to seven from five. (A pair of second-row bucket seats are available for $6,000. That price also includes the two-person third-row bench.) While the rearmost row is fine for young children, its cramped quarters are less-than ideal for adults. Annoyingly, Tesla forgoes folding center armrests for both second and third-row passengers. 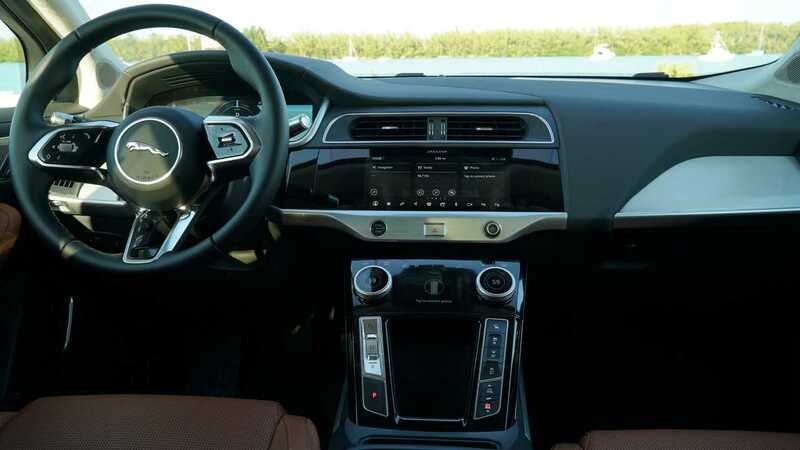 Jaguar: The I-Pace is the first Jaguar to receive the brand’s latest dual-screen infotainment system (the setup is also available in certain Land Rover models). Dubbed InControl Touch Pro Duo, the setup features a pair of dashboard-mounted touchscreens that measure in at 10.0 and 5.5 inches, respectively. A handful of knobs pepper the dashboard and control things such as the stereo volume, fan speed, and interior temperature (the latter of which Jaguar combines into the same knob that also controls the car’s seat heating and cooling functions). Despite those ergonomic benefits, the system is often slow to respond to touch inputs. Meanwhile, a myriad of menus makes exploring the depths of the system a somewhat intimidating affair. 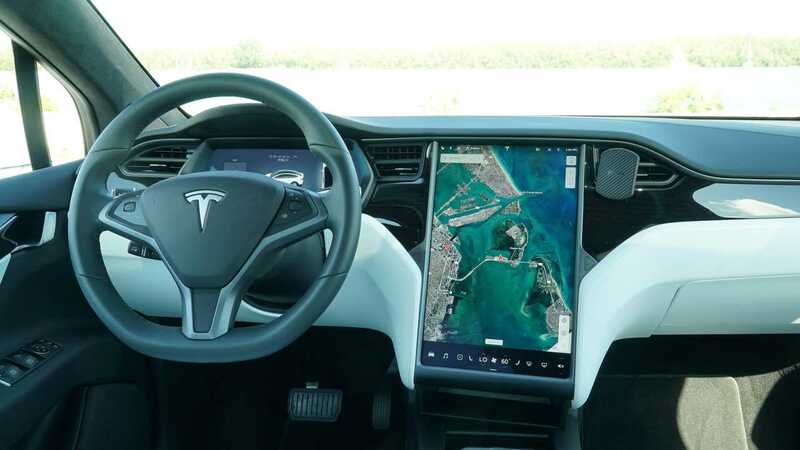 Tesla: Tesla’s massive 17.0-inch touchscreen remains the crown-jewel of infotainment systems. Well, at least if you value looks above ergonomics. With crisp graphics, quick response times, and a clean interface, the screen’s most egregious fault is that it has the near-impossible task of controlling just about every comfort and convenience function. Want to open the power tailgate? You’ll need to dig through on-screen menus to find the function. Same goes for turning on the headlights. The list goes on. In many instances, the Model X’s heavy-dependence on its infotainment screen for controlling even the simplest features leads to more hassles than benefits. Yet, the Tesla infotainment system feels like the more polished of the two, even if we think its shine is beginning to dull. 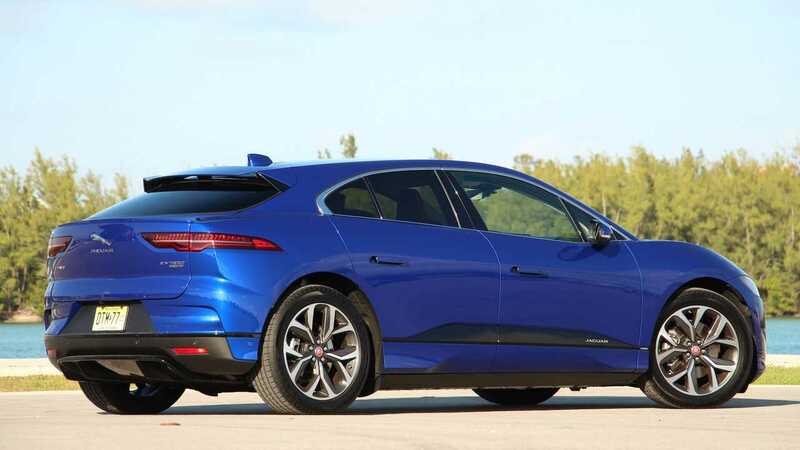 Jaguar: Practicality is not the I-Pace’s forte. With a maximum cargo capacity of 51.0 cubic feet, the Jag is down more than 30 cubes to the Tesla. Both vehicles offer limited interior cubbies, as well, and the I-Pace relies on a covered center console as the primary source of cabin storage. An open area aft of the push-button gear-shift selector and reasonably sized door pockets also serve as hiding spaces for small items. Tesla: Small-item storage in the Model X is no better, and passengers must make do with a relatively shallow covered storage bin ahead of the center console armrest. The Tesla’s biggest surprise, however, is its frunk, which provides a sizeable space for storing items such as groceries and small travel bags. The Jaguar also hides a storage area under its nose, but the small space can barely handle a messenger-style laptop back. 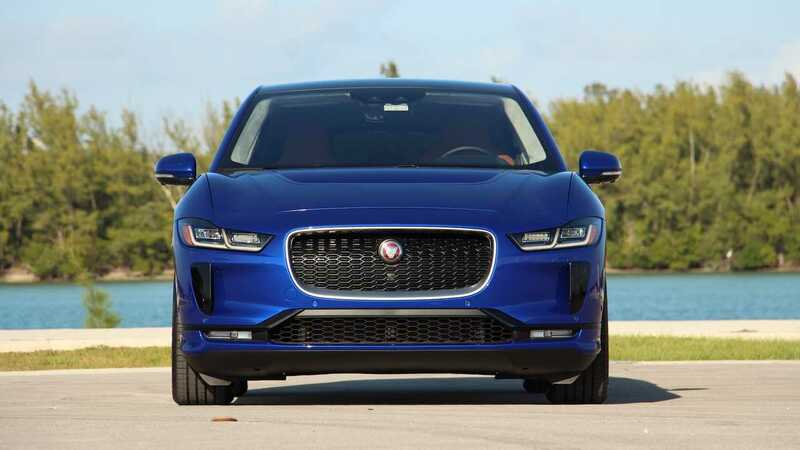 Jaguar: Every I-Pace comes standard with low-speed automatic front braking that includes pedestrian and cyclist detection, lane-keep assist, rear-cross-traffic alert, a parking-assist system for parallel and perpendicular parking, and parking sensors for the front, rear, and sides of the vehicle. To this, our HSE tester – an $11,000 upcharge on the entry-level $69,500 S trim – adds high-speed automatic front braking, blind-spot monitoring, a surround-view camera system, and adaptive cruise control with lane-centering. A head-up display ($970) is available for additional piece of mind and allows the driver to keep their eyes focused on the road at all times, as opposed to dividing time between the road and the 12.3-inch digital gauge cluster below. Although both the Jaguar and Tesla active safety systems perform admirably, the Tesla’s Enhanced Autopilot system feels just a little more adept. 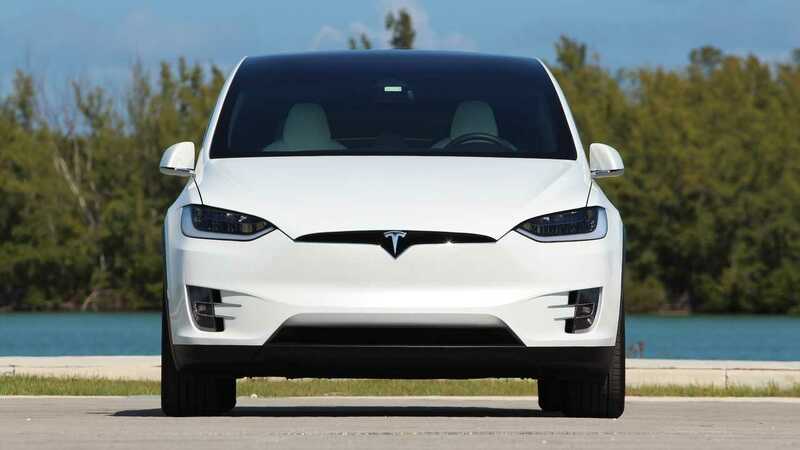 Tesla: The Model X comes standard with the ability to bring itself to a stop in the event of a forward collision. However, Tesla bundles just about every other active safety feature into the $5,000 Enhanced Autopilot package. This extra-cost item permits the Model X’s standard ultrasonic sensors and 360-degree camera system to monitor the vehicle’s surroundings. Enabling the 12 sensors and eight cameras to perform Enhanced Autopilot duties after delivery of a Model X is a $7,000 fee. With Enhanced Autopilot online, the crossover includes an adaptive cruise control system with lane centering, an automatic lane-change function, a parking-assist system for parallel and perpendicular parking, and the brand’s kitschy “summon” feature, which allows the Model X to autonomously drive itself into or out of spaces at low speeds without a driver behind its wheel. 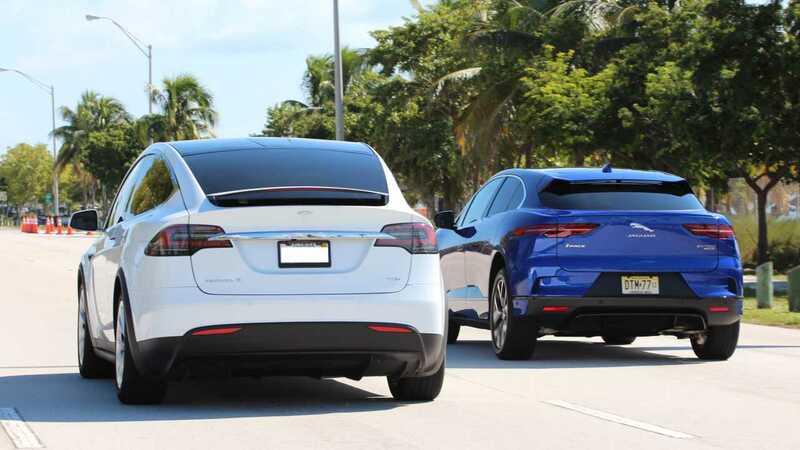 Although both the Jaguar and Tesla active safety systems perform admirably, the Tesla’s Enhanced Autopilot system feels just a little more adept. With its digital gauge cluster showing the cars and trucks surrounding the vehicle in real-time and its automatic lane-change feature accurately moving the electric crossover around slower moving traffic, the Model X’s Enhanced Autopilot system feels as though it requires a smidge less driver interaction when left to its own devices. Of course, Enhanced Autopilot does require the driver to be ready to step in to take over at a moment’s notice, and we do fear Tesla buyers getting complacent and allowing the system to be more responsible for driving duties than its current capabilities allow. We hope Tesla continues to remind Model X buyers that Enhanced Autopilot remains very much a semi-autonomous, and not an autonomous, driving system. Jaguar: Despite its smaller size, shorter stature, and lesser mass, the Jaguar is actually the less efficient of these two crossovers. The EPA rates the I-Pace at 80 MPGe city, 72 MPGe highway, and 76 MPGe combined. 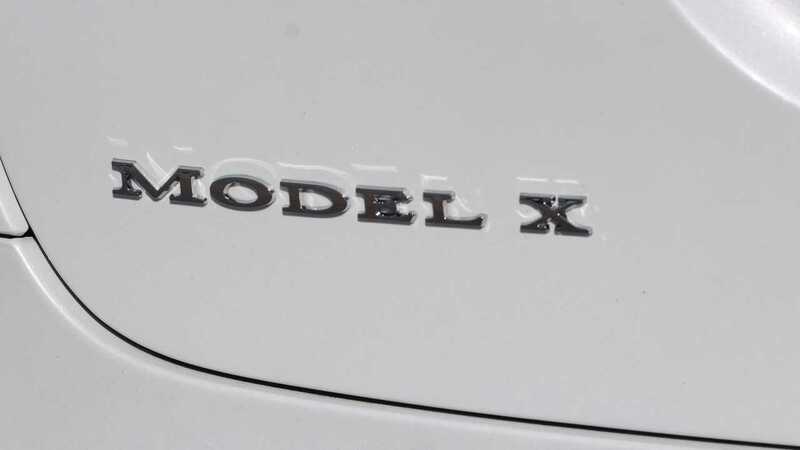 By comparison, the Model X 75D earns 91 MPGe city, 95 MPGe highway, and 93 MPGe combined. 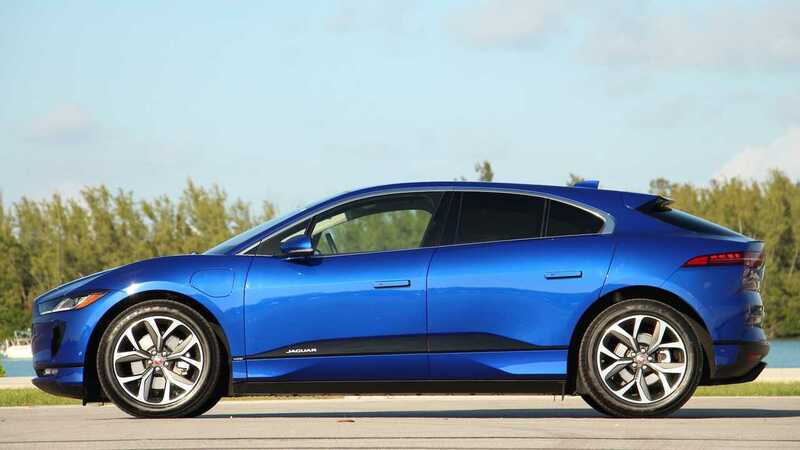 The Tesla’s extra efficiency allows its 75-kWh battery pack to push it 238 miles on a full charge, while the Jaguar’s 90-kWh pack only manages 234 miles. Still, the I-Pace offers plenty of range for the average consumer, and it’s able to make the most of its electricity by way of aerodynamic tricks such as an air suspension that helps reduce drag by lowering the body 0.4 inches above 65 mph, a big hood scoop that channels air over the windshield, and exterior door handles that fold flush with the body upon locking the doors. 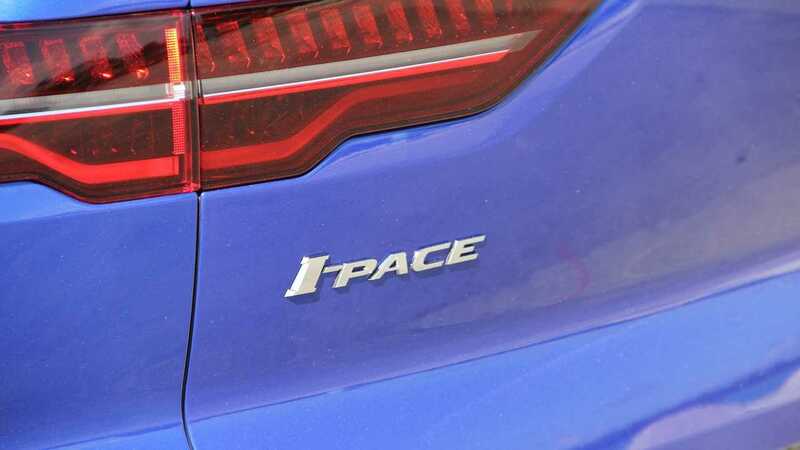 The I-Pace offers plenty of range for the average consumer. Tesla: Whereas the I-Pace’s aerodynamic tricks afford it a drag coefficient of 0.29, the massive Model X’s round shape and adjustable air suspension help it achieve an even better drag coefficient of 0.25. For reference, the Toyota Prius hatchback manages a drag coefficient of 0.24. Neither crossover is particularly quick to charge at home, though. Find one of Tesla’s many superchargers for the Model X or a DC fast charger for the I-Pace, and both vehicles’ battery packs add charge rather quickly. In fact, Jaguar claims the I-Pace is capable of adding an 80 percent charge to its empty battery pack in as little as 40 minutes. Jaguar: With a base price of $69,500, the I-Pace undercuts the Model X by more than $14,000. That’s a sizeable chunk of change for consumers simply looking for an electric luxury crossover SUV capable of traveling more than 200 miles on a full charge. The entry-level I-Pace S is a well-equipped vehicle, too, and comes standard with items such as dual-zone automatic climate control, a power driver’s seat, a proximity key with push-buttons start, and the brand’s InControl Touch Pro Duo, which includes an in-dash navigation system and Apple CarPlay and Android Auto compatibility. Adding options and moving to the higher-end SE and HSE trims, however, cuts into the I-Pace’s relative value. This $80,500 HSE model’s plethora of options and $995 destination charge resulted in an as-tested price of $88,840, making it nearly $20,000 more expensive than an entry-level I-Pace S.
Tesla: Sporting a base price of $84,000, the Model X is far more expensive than I-Pace. 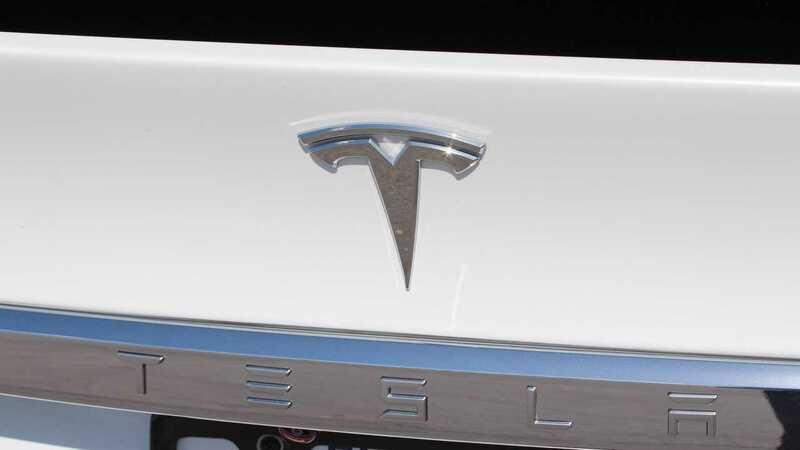 Yet, the Tesla’s greater price also reflects its additional capability. 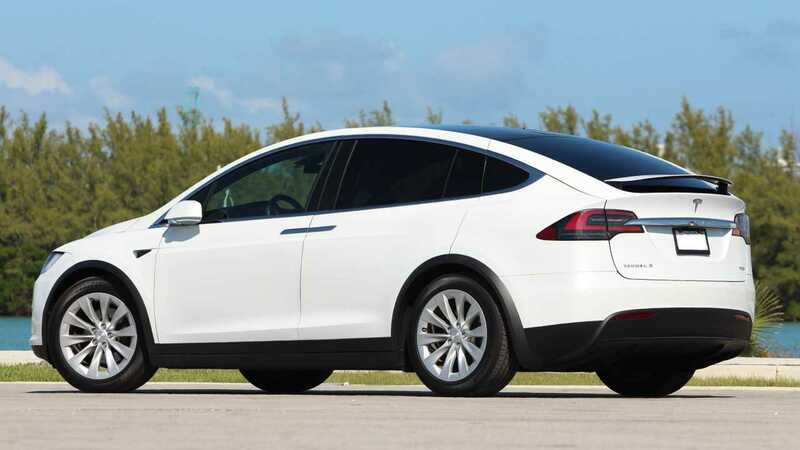 Along with its bigger interior and cargo bay, the Model X can tow up to 5,000 pounds. Jaguar, on the other hand, does not rate the I-Pace for towing. 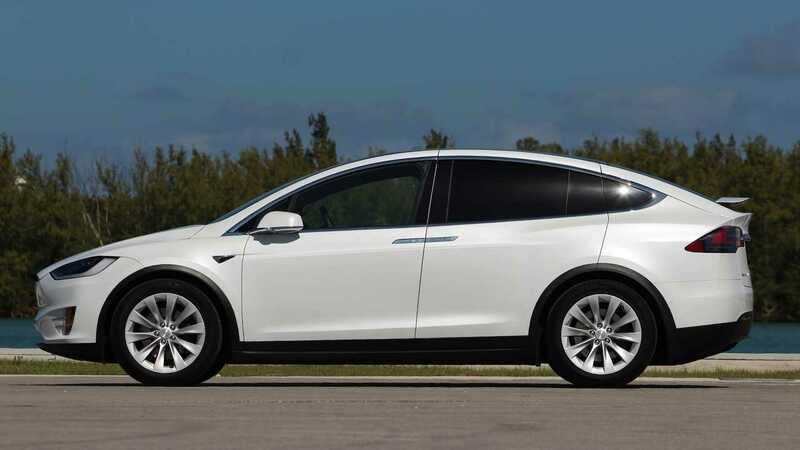 With a third-row seat, Enhanced Autopilot, and a $1,200 destination fee, this Model X 75D came in at $96,700. That’s $16,200 more than an I-Pace HSE. Ultimately, the Jaguar’s sub-$70,000 starting price makes it more attainable for a greater number of individuals, even if it’s smaller size and inability to tow means it fails to serve some consumers as well as a Model X. These are two very different vehicles aimed at different consumers. 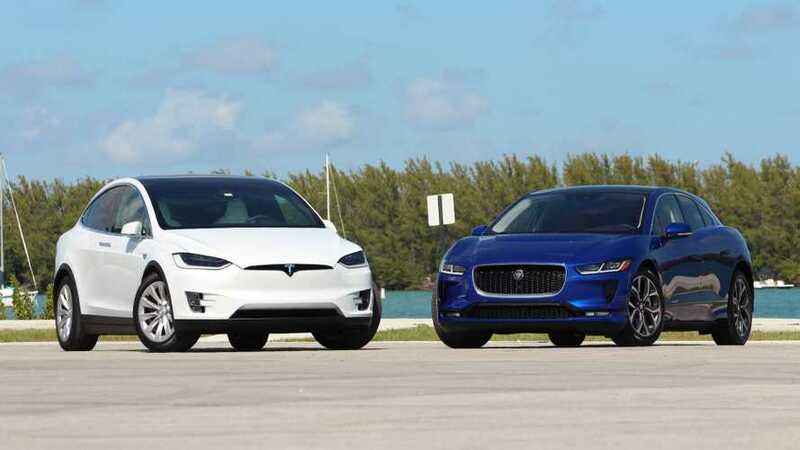 Nevertheless, both battery-electric vehicles are sure to be cross-shopped due to their similar performance, driving range, and crossover body styles. Although the Jaguar is the better looking and more enjoyable of the two to drive with fervor, it’s also the worse crossover. It’s smaller and more cramped inside, can hold less cargo, is unable to tow, and seats a maximum of five. Thanks to its larger size and available third-row seats, the Tesla is more adept at carrying passengers and cargo. Plus, it can tow sizable sums and actually offers marginally more driving range than the Jaguar. 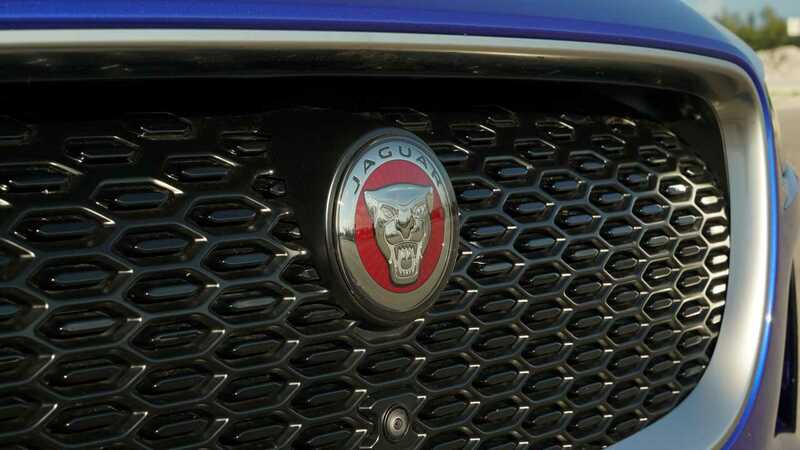 This isn’t to say the Jaguar is bad – far from it. But, as equipped, this $88,840 I-Pace’s attractive styling and engaging driving dynamics can’t overcome the extra efficiency, versatility, and capability of the Model X.